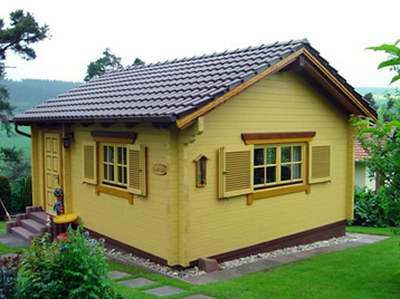 Which small log cabin works best? 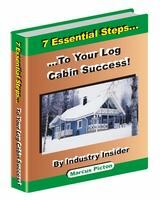 The overall size of your small log cabin will be critical. For some people this space will be dictated by the size of the plot they have available for building their log cabin. In this case utilising the space effectively is crucial. For others the size will be down to their own choice, although cost often becomes are deciding factor. Remember with a small log cabin that the squarer the design, generally the lower the cost ratio between the external walls and internal space. So keep you design as near to square as possible and avoid long and thin layouts. Remember too that the overall footprint is not the net internal floor area you will end up with. Try to visualise what the internal space will look like. This is very difficult in 2D, so drawing lines on the ground generally only makes you think that the space is going to be way too small! The best way to do this is to try and find a similar size room and divide it up as you were planning to use your log cabin. If you don’t have a big enough room, then try to visualise what 2 rooms might looks like for example. The important thing is to be looking at wall in front of you, as this gives you the idea of space much more clearly than a plan on a piece of paper, or lines on the ground. If possible of course try to visit a log cabin which is the same size as the one you are considering. Often small log cabins will use thinner logs. The log size is to some extent proportional to the overall size, but there comes a point where too thin logs might not be right for you. Too flimsy logs may give issues with security, warmth, strength and rigidity, longevity and maintenance. My advice is it is better to buy a slightly smaller but better made log cabin, than a bigger one which either won’t last or doesn’t perform well enough. Whilst cost is very important, your logs are crucial as well. So especially where the timber quality is also not especially good, try to avoid logs which are too thin. A problem with your logs, can soon become a big problem! 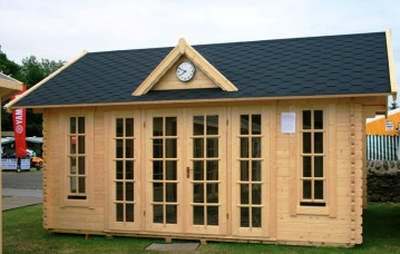 Always try to think long term, when choosing your log cabin. Design in a small log cabin is important. External design gives you the character from the outside and this is important for most people. Pay particular attention to the logs, roof design, windows and doors and the finishing trims. Not only should all these aspects be functional but they should look nice too. Sometimes really budget log cabins can be very cheap, but also very bland. Small overhangs, basic soffit designs and boring trim can often be at blame here. Internally the design is no less important. Remember with limited space to maximize your floor area, by avoiding dead space. Plan ahead and work your layout out now. Make sure any furniture you want to use, fits properly and you don’t end up blocking doorways or conflicting with windows. Also think about how much glass you want. It is nice to have plenty of natural light, but too many windows may restrict your options and will reduce useful wall space. If you are unsure what the future will bring, it may pay to leave the design as open as possible and use removable room dividers to keep your options open. The way your log cabin faces is important. The view out is obviously going to influence your decision, but also consider which side will get most sun and where the prevailing winds come from. Look around and see if any large objects near by, which could have an effect on your location. Think about access to your log cabin too and weigh up all these factors to come up with the best way to site your log cabin. Remember you can’t change it once its done, so get it right first time.